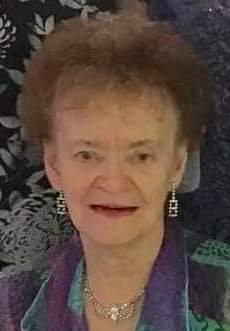 Marilyn M. Richard, 82, of Streator passed away Tuesday, November 20, 2018 at O.S.F. St. Elizabeth Hospital in Ottawa. Mass of Christian Burial will be at 11:00 A.M. Monday, November 26, 2018 at St. Michael the Archangel Church, Streator. Rev. Fr. Ryan Mattingly will officiate. Visitation will be from 2-5 P.M. Sunday, November 25, 2018 at the Solon-Telford Funeral Home, Streator. The rosary will be recited at 4:45 P.M.
Burial will be in St. Anthony Cemetery, Streator. Pallbearers will be her grandchildren, Christopher Lee, Andrew Million, Adam Million, Hezekiah “Pat” Serayah, Joseph Maenza and Richard Greenwood. Born June 5, 1936 in Streator she was the daughter of Frank and Ludmilla (Wirges) Coates. She married Lowell Richard on June 11, 1955 at St. Anthony Church. They were married by Rev. Fr. Gerald Brinkman O.S.F. Her husband preceded her in death. She was preceded in death by her parents; her husband; a daughter, Pvt. Mary Louise Howard; an infant son, Michael; son in law, Mark Million; grandparents, George and Marie (Wistecka) Wirges; favorite aunts and uncles, Edward and Louise Wirges, Helen and Art Horton, Loretta Wirges, Leroy Wirges; and a sister in law, Sharon Simons. Born and raised in Streator she graduated from St. Anthony Grade School in 1950 and Streator High School in 1954. She had previously worked at Silverfross Root Beer Stand, Kresges, Montgomery Wards and Lipton Tea. Her life was her family and going to church every Sunday and almost every day. She was also a very active volunteer. She was a member of the former St. Anthony Church and the St. Ann’s Altar and Rosary Society of her church. An active member of the Parish she belonged to the St. Anthony Mother’s Club, Parents Club, and Athletic Club. She also belonged to the Folk Choir and the Senior Choir as well as volunteering as a Cantor and Lector. She was active with R.C.I.A, Christ Renews His Parish, Tuesday Bingo, Streator Women’s Club, Christian Women’s Club, Eagle’s Auxiliary and the Knights of Columbus Auxiliary. Through the years Marilyn enjoyed volunteering at the St. Anthony Library, Turkey Dinners, Salad Luncheons and Bingo. She loved her Soap’s, rooting on the Chicago Bulls and eating out, especially at Country Cupboard. Memorials may be made to St. Michael’s Parish and the American Diabetes Association.